Since North Korean leader Kim Jong-un pledged to visit Seoul in return for President Moon Jae-in’s September trip to Pyongyang, whether Kim will keep his promise has become a point of much speculation. Some experts have suggested Kim’s visit could take place as early as next week amid rumors that some tourist destinations in Seoul have turned down reservations for that period. Others say Kim will come to South Korea more than two weeks later, after he marks the seventh anniversary of his father’s death on Dec. 17. While North Korea continues to remain mum about its leader’s first-ever visit to the South, there appears to be another option for Kim to make his unprecedented trip in a safe yet dramatic way: a surprise visit. “Even if the South Korean presidential office were notified by the North about when Kim would visit Seoul, the government may be reluctant to reveal it to the public immediately,” a government source familiar with inter-Korean relations told The Korea Herald. “The presidential office is aware of the risks Kim is taking and President Moon wants to welcome Kim as much as possible. … Cheong Wa Dae doesn’t want to give enough time to anti-North groups to protest against Kim’s visit,” the source added, requesting anonymity due to the sensitivity of the issue. Following a fierce battle with North Korea during the 1950-53 war, and subsequent skirmishes along the cross-border region, the sight of the North Korean leader traveling across downtown Seoul is unimaginable to most South Koreans. 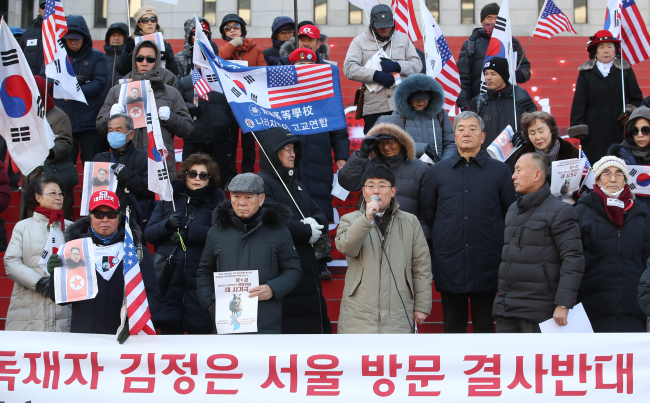 After Cheong Wa Dae announced that Kim would visit Seoul within the year, some ultraconservative groups threatened to arrest Kim for his repressive rule and human rights violations. They even launched an online campaign to recruit those who want to join the move. Such strong, lingering hostility toward Kim and his country may put the Moon administration in a difficult position, as the government wants to use Kim’s visit to highlight its efforts to encourage North Korea to abandon nuclear weapons and open up its economy. “From President Moon’s perspective, he wants to respond to Kim’s requests as much as possible, given the risks Kim was taking when he decided to visit Seoul,” said Park Won-gon, an international relations professor at Handong Global University. Kim reportedly told Moon in September that he would proceed with his Seoul visit despite opposition from conservative groups in the South. However, making a trip to the country with which the North is technically still at war is a risky move. For six years, after taking over North Korea following the death of his father in 2011, Kim never left the country. The image of Kim as a reclusive leader only changed after he kicked off a flurry of diplomatic activities earlier this year. But even when Kim made his first visit abroad to China in March to meet with President Xi Jinping, the world found out about it only after the North Korean leader had crossed the border with China. Chinese and North Korean state media confirmed the summit after the event took place. The worst nightmare for North Korean propagandists would be that of Kim traveling around Seoul under scathing criticism by hostile groups, and such images being broadcast live worldwide by international media. North Korea is notorious for its strict control over the media. Not only does it control information coming in and out of the communist country, but it also seeks to change content in its favor. For example, the death of Kim Jong-il, the father of Kim Jong-un, was not revealed to the public until two days after it occurred. When Kim Jong-un executed his uncle Jang Song-thaek, images and stories related to Jang were removed from the North’s state media. “Kim’s every move in Seoul will be broadcast live around the world. And yet North Korea can’t afford any negative image of Kim during his visit. That is the dilemma,” said Park of Handong Global University.